Live is the first live album by Status Quo, recorded at the Glasgow Apollo in October 1976 featuring the classic line up of the band. I saw Quo in about 1977 so this captures the band very much as I remember them. The sound is basic but the songs are endearing. I’ve got this playing in my car at the moment and I can’t stop playing CD 2 because it’s such a lot of fun. In 2014 a boxset version of this album was released with two extra concerts, from Sydney, Australia in 1974 and Tokyo, Japan in 1974. Because this is effectively the set list that I saw, I don’t mind the fact that earlier hits like Down Down and Paper Plane are missing or that it’s recorded before Quo recorded Rocking All Over The World and Whatever You Want. CD2 is really terrific. Big Fat Mama was my favourite when I saw them and I’d never heard the song before. Caroline is Quo epitomised in one song. I’d bought a live version of Roll Over Lay Down and their covers of Roadhouse Blues and Bye Bye Johnny are a lot of fun. Unfortunately CD1 isn’t so good. It establishes the chugga-chugga-chugga style of Status Quo which somehow makes you want to move your head up and down more than move your hips or tap your feet. I’ve no idea why. Unfortunately the songs aren’t as strong and casual fans may give up before they play CD2. That would be a waste. There’s something about Status Quo and their simple boogie style which is very exciting when it works and dull when it doesn’t. Live captures them at peak form. Some of the songs are extended by getting into the groove like a funk band rather than over-indulgent soloing like Led Zeppelin could do. Love it or hate it? Leave a comment and tell the world why. 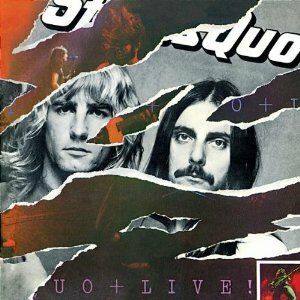 Is this the best live album by Status Quo? I don’t have a separate poll for Quo but they are a dominant band in the boogie rock poll. This entry was posted in 1970s Live Albums, Blues Rock Live Albums, Boogie Rock Live Albums, Classic Rock Live Albums, Heavy Metal Live Albums and tagged 1970s Blues Rock, 1970s classic rock, 1970s hard rock, 1976 live albums, blues rock 1976, classic rock 1976, Heavy Metal 1976, Status Quo Live Albums by Paul Simister. Bookmark the permalink.